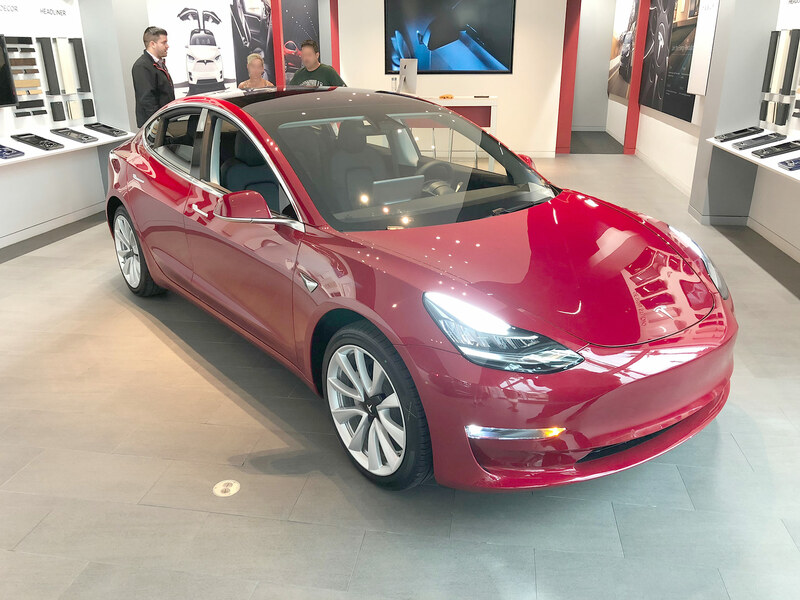 Taking the delivery of your dream car is a big day no doubt and in the case of a Tesla Model 3 its even bigger if you are waiting for a couple of years — therefore we prepared a detailed Tesla Model 3 delivery checklist in collaboration with the Facebook group ‘Tesla Tips and Tricks’ and its admin Navid Gondal. Since now Europe is on the verge of getting their Model 3s delivered and thousands of them have already shipped to the region, European potential owners should prepare to get the delivery of the car they have waited for almost 3 years now. Have the Tesla app installed on your smartphone prior to arrival for delivery. If your car will be registered to more than one person, each person on the registration needs to be at the delivery appointment to sign final documents. Bring written or digital proof of your down payment having been made and the final payment details or financing details. 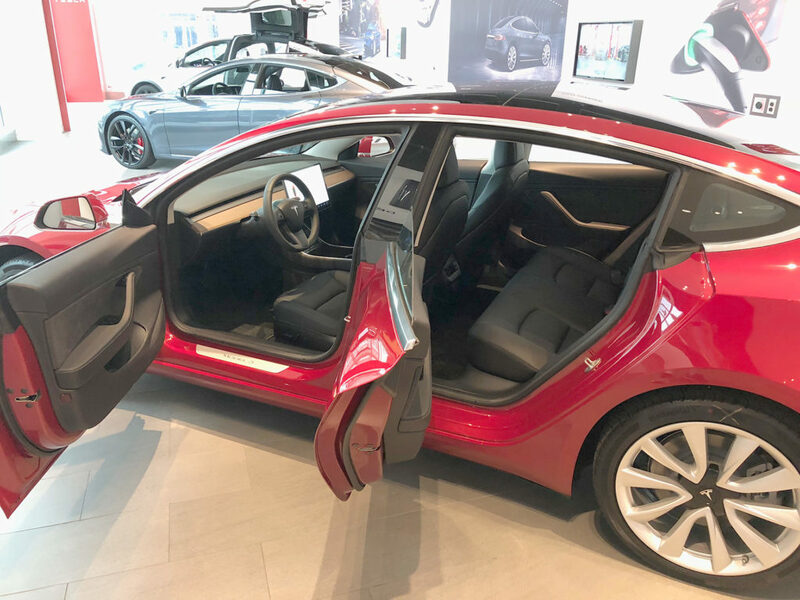 If you are financing your car, make sure your loan has been funded before you arrive to take delivery and that you have some kind of proof you can provide to Tesla should they ask about it. Bring a printed insurance card or other proof of insurance that shows your Model 3 is insured. Since the delivery area where you will inspect your Model 3 may be dark, bring a flashlight. Check for correct name and address on your paperwork. Confirm vehicle’s VIN matches your paperwork. Watch for any error messages on the display screen. Check for correct vehicle body color and wheels. Inspect body exterior paint for defects. Inspect vehicle underside (front & rear) for signs of damage. Check for body panel misalignments. Inspect wheel rims for damage. Inspect all glass for signs of distortion or cracks. Check for proper windshield and windshield trim installation. Inspect all edges of the roof glass panel and rear window. Take a deep breath and a short break for a few seconds to rejuvenate and don’t let the excitement take over your analytical powers… continue! Test all doors to ensure they open and close without unreasonable effort. Check paint in areas, such as door hinges, that are not visible when doors are closed. Some deliveries have reported incomplete body painting in hidden areas. Ensure door windows auto-close completely when doors are closed. Test driver & passenger door emergency release. Check all 4 windows to ensure they open and close properly. Test opening and closing of trunk and frunk. Check paint in areas that are not visible when frunk and trunk are closed. Some deliveries have reported incomplete body painting in hidden areas. Check for the towing eye under the frunk mat. Depending on country/state requirement, check for front license plate bracket. Inspect interior seat upholstery, door surfaces, dash, headliner & carpets (including passenger compartment, frunk & trunk). Check left & right clothing hook operation. Take a deep breath again, regain focus and continue, it’s not done yet! Check all seat belts for proper operation. Check rear seats for proper fold-down operation. Test sound system to ensure all speakers are working. Test steering wheel position controls to ensure proper operation. Press the center of the steering wheel to make sure the car’s horn works. Check side mirrors for proper operation of folding and position adjustment. Now you can have a cup of coffee or whatever drink is available to freshen up for the next round of Tesla Model 3 checkup. Front overhead driver & passenger lights. Rear overhead left & right side lights. Rear left & right door pockets. Driver & passenger door puddle lights. All door latch button lights. All door window button lights. Glovebox light (check glovebox opening and closing). Left & right side turn signal lights. Check all front and rear exterior lights for signs of internal condensation. Check the charge port door for proper operation. Check the charge port indicator light. Ensure vehicle will accept a charge. Check mobile charging kit. Test it to ensure it works. Test both key cards to ensure they work with your car. Keep one key card on your person in case the phone app does not operate properly. Attempt to pair your smartphone to your car on Bluetooth. Ask your delivery specialist to make sure that your car is marked as DELIVERED in Tesla’s network. There have been reports of cars being delivered and the phone app doesn’t allow log in the following day. This is due to the oversight of the car not being identified as having been delivered in Tesla’s system. Check display screen for any information that does not match the car. 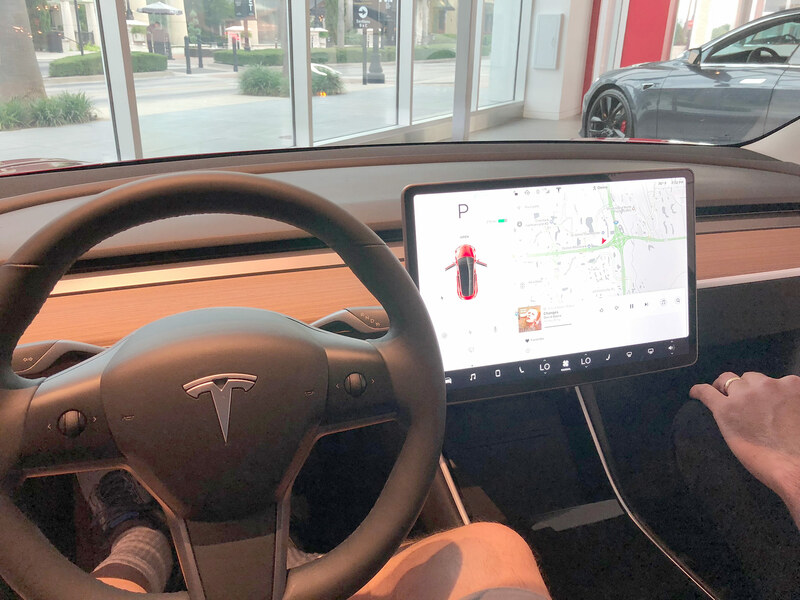 Touch the Tesla T at the top of the screen to bring up the About Your Teslawindow. Tap the unicorn drawing to access the Sketch Pad. Leave the Sketch Pad up for a minute to make sure there are no phantom touches happening on the display. Listen for any unusual sounds coming from vehicle exterior or interior. Some sounds may seem unusual at first exposure. It is normal to hear fans and relays that operate at times depending on the car’s situation. If you plan to use a USB stick containing music, plug the USB stick into one of the front USB ports in the console front compartment to determine if the car will properly read the data. Make sure you have copies of all paperwork necessary for good documentation of your purchase, including a copy of your signed purchase agreement. If your delivery specialist suggests that you can get your documents electronically on your Tesla account, ask for paper copies you can take with you anyway. Having physical copies with you ensures you will get them. Last but not least, you can download these instructions in PDF format for printing and offline use. 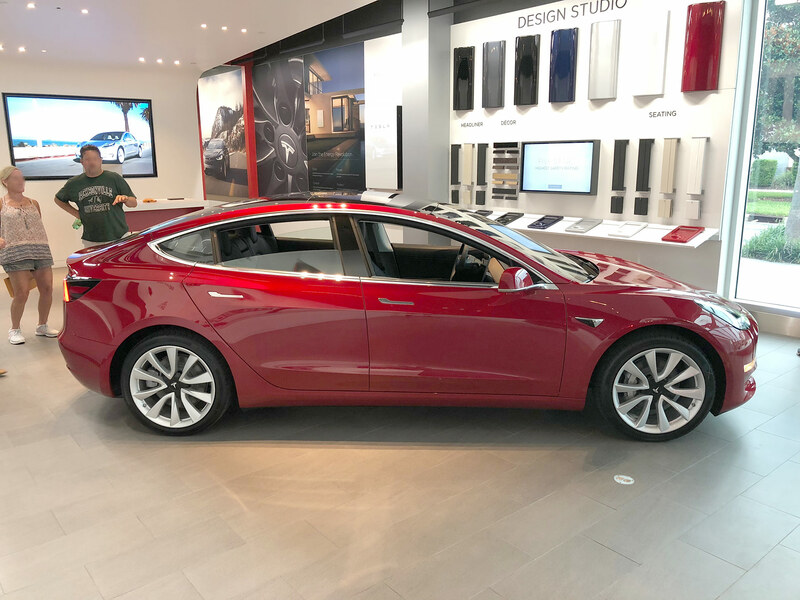 Photos: Tesla Store Jacksonville, Florida by Scott Kelly with exclusive permission to publish.